Absolutely every parent finds out, sooner or later, what whining is, and not because they suddenly remember themselves whining as kids. 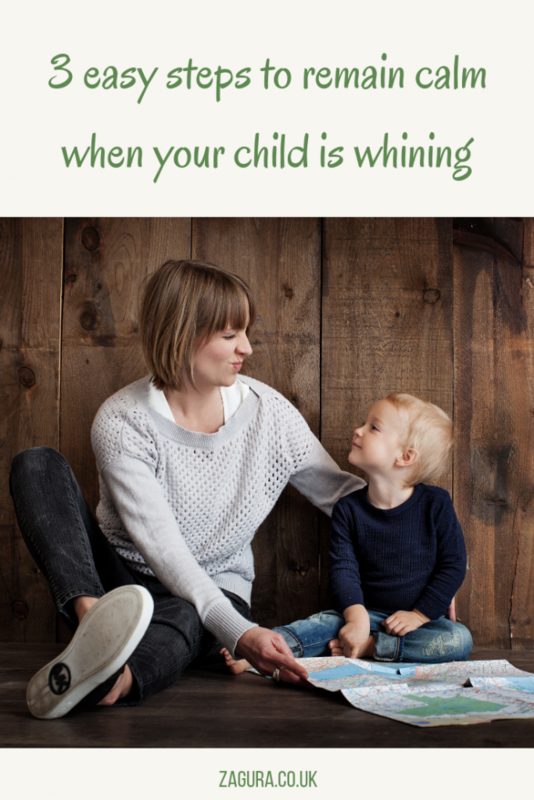 It may seem like children are experts at whining, as they can do this often and for minutes on end. Whining is important communication, not manipulation, and should not be ignored as it always has its reasons and holds messages like “I’m feeling helpless” or “I feel lonely”. 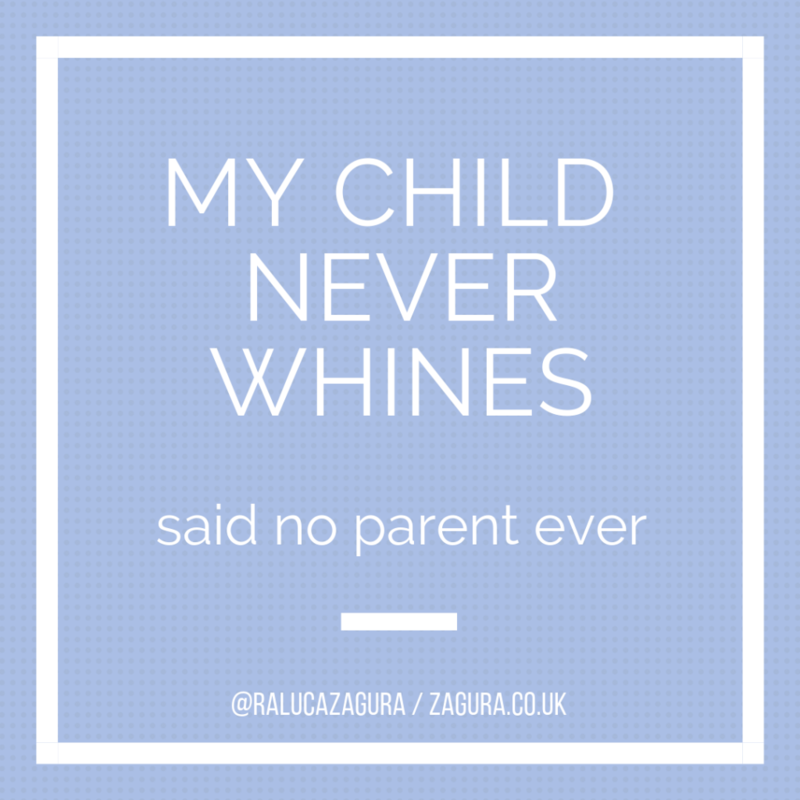 However, I will dedicate a separate post to talk the reasons why kids whine and what they actually need from their parents. 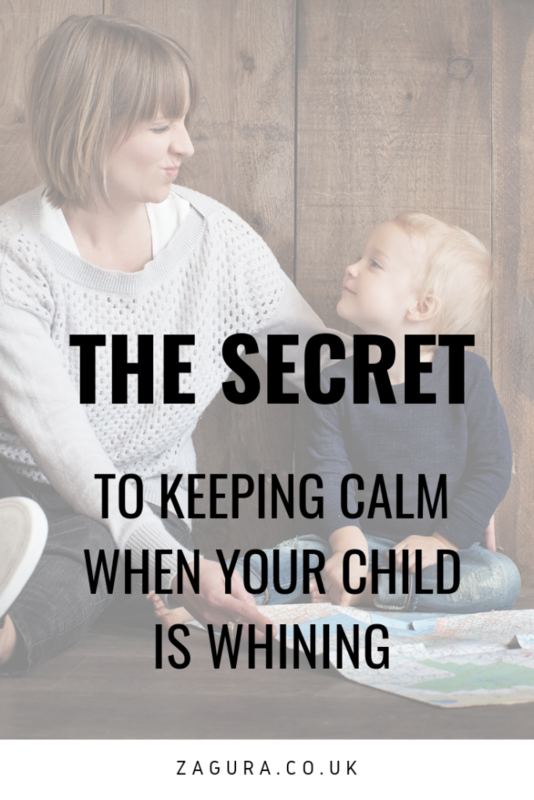 In this post I will talk about how us, parents, can easily keep calm when our kids start to whine and still be calm even when the whining goes on for 5 or 10 minutes, however long it takes for us to be able to assist them. Whining is “the making of a long, high-pitched cry or sound”. And this sound can be really irritating from the moment it starts. That’s because it can trigger irrational feelings inside us, like feelings of resentment, exhaustion, painful memories from our own childhood, even anger. A while ago my youngest was whining. She was anxious for the courier to deliver a toy she had longed for. She was going on and on about her being tired of waiting and asking “when is the courier coming?”. I had answered her question, I had told her I don’t know, I had assured her the courier was to come. Nothing helped, so I knew the message she was transmitting was one of the following: “I feel alone” or “I feel powerless” or “I feel disconnected from you”. And even though I knew what she needed, I couldn’t provide it for her that very moment. The whining was continuing and I was getting more frustrated, wishing for a moment of peace to finish what I was doing in order to attend her. My frustration was growing and I realized it was heading towards anger. And I remembered that whining can trigger irrational emotions. So, I found myself thinking “Why?! Why does her whining frustrate me so much? What do I feel right now?”. And that was my moment of calming down. I realized that, when she was whining, I was feeling the urge of emergency and in my own eyes, I was failing to solve it. In my own eyes, I was seeing myself as being responsible for her happiness. I was feeling like she was expecting something from me and I wasn’t providing it, so I was letting her down. I was feeling helpless and as if I was not a good enough mom for her, “I know what to do and I am not doing it right this very minute? What kind of mother am I?!”. And then it hit me: I was the only person in the whole world that was putting pressure on me. My child was not judging me. She was safe, I had acknowledged that she had been heard and I was planning on connecting with her as soon as possible. She was communicating her needs, and this shouldn’t be a reason for me to get frustrated or angry. Communicating needs is healthy, I should learn from her in fact! So I just had to let go of the pressure and guilt and accept that it’s not humanly possible to be available for your child every second of the day. I had to accept myself as being a human being that cannot do everything at the same time, one that is not perfect, but one that does her best. Realizing that my child’s whining was not about me made me calm just like that. I was no longer feeling as if I was disappointing her, as if she was expecting something from me that I couldn’t provide for her. I was no longer taking it personally, as if her whining was my fault. I could see more clearly the whole situation and I could actually be calm, finish what I was doing without yelling at her, and then be with her, calm and supportive. Asking myself “What do I feel when I hear her whining?” made the switch from me clenching my teeth and being all angry and fighting the urge to yell, to me being calm and able to listen to my daughter and understand her better. Why does whining trigger feelings inside of us? If you grew up feeling that you were never good enough, that you were unlovable and always disappointing those around you or if you were always compared to those around you, whining can trigger these memories. You might have a certain image in your mind of how you should be as a mom, and when you can’t be as you think you should, you once again feel not good enough or that you are disappointing your loved ones. And this was painful when you were a child, and is again painful now. If you were punished as a child for whining, yelled at or even spanked, all these emotions can be triggered when your kids whine. In your mind, pain is associated with whining, and it again hurts. Or because you feel like “It’s not fair, I was punished when I whined, why? And how come this child whines in my ears and is not punished? What did I do wrong, why was I punished?”. If you felt misunderstood and not accepted for whom you were as a child, you mind find yourself thinking “He is just whining, why can’t he understand I am busy right now?”. You again feel misunderstood, and it’s painful. Accept all these feeling and thoughts and don’t judge yourself for having them. They don’t make you a bad person or mom. They just mean you are a human being that was hurt as a child. Be kind to yourself and offer yourself now acceptance, understating, empathy. So as soon as the whining starts, ask yourself “What am I feeling right now?” and give the real answer, not the “oh, I am annoyed because I am in a hurry” one. This will help you in two ways: first, it will change your focus from your child and this will quickly calm you down, and second, it will help you get to know yourself better and even heal a bit. So it will go from “Oh, no, here we go again with the whining, I can’t stand it! Stop whining!” to “Oh, this whining is painful, I wonder why… is it because I was punished for whining, as a child? If so, what did I need as a child, instead of punishment? Acceptance? Understanding? Empathy? Can I offer this to myself now?”. This is an interesting (and painful at times) process because you remember and understand things about yourself, and in time you learn and you heal. And soon, your child’s whining will no longer trigger anything, it will no longer be painful. 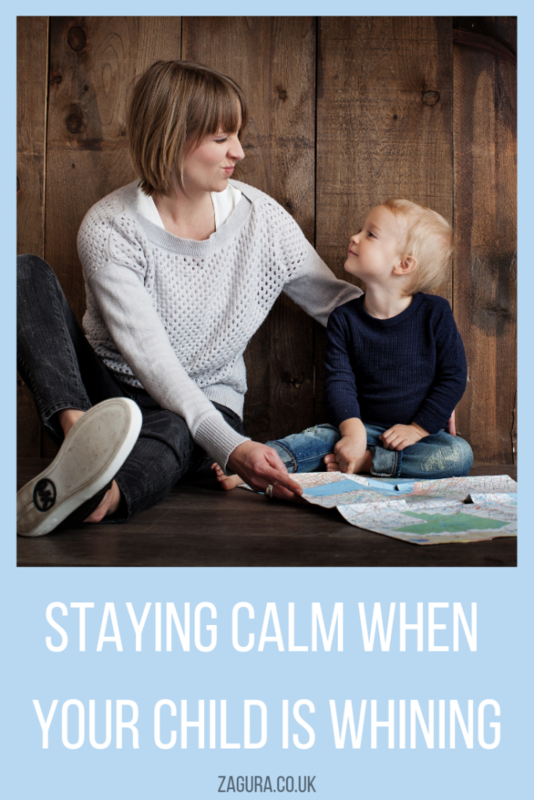 It will just be, and you will be naturally calm and able to attend your child as soon as possible, be it in one second or ten minutes, in an understanding, supportive and emphatic way. You don’t have to do this every time, don’t put pressure on and don’t judge yourself when you don’t. Just try and take the above 3 steps every time you remember them. You might find it easier if you write them down or save this post. One day you will find yourself being naturally calm and not needing these three steps again. This was a lengthy and helpful report! I am sure it will be of benefit to those fortunate enough to read it 😉 I suppose one must also be reminded that children are somewhat different in regards their whining… some whine more than others, no? Life is complex. The environment at home and parenting (or lack thereof ) contributes so the frequency of these problems don’t you think? I’m sure you have seen cases first hand where the parent “has no clue” how to deal with a child and, through their utter incompetence, end up creating a real little monster with some serious problems 😀 Giving small children complex choices between foods or rewards is often seen to lead to disaster etc., Another curious thing that I see constantly is the complete lack of concern for a child’s proper rest or sleep! Small children under, say 4, running around after 11pm every night, outside with the parents coming home from restaurants or visiting, is now apparently commonplace and considered normal. Huh? Whatever happened to the extra requirement for sleep and rest to grow healthy? These are old fashioned ideas that no longer apply. Perhaps the human genome has changed lately and such tissue regenerative processes and neural development can progress during waking hours? I’m being facetious of course… 😉 Yup. Sure is amazing what one sees out there…. I always feel like I need a doctorate in psychology in order to be a parent—not only to understand where my kids are coming from, but to understand my reactions to them. I will definitely be keeping your three steps in mind when my kids whine again- -which should be in about three minutes. 😂 Thanks so much for this thoughtful and helpful post! These are great tips for handling those difficult situations. Thank you for sharing!